Benotime Teddy Bear by Steiff. This beautiful hand made piece, in cream and brown mohair, wears the white ear tag, signifying this item as a Steiff limited edition, together with the famous gold plated Button in Ear. Limited edition of only 750 pieces worldwide. Product details: fully jointed (loosely jointed head ), safety eyes, synthetic filling material, non growler, size 25cm. Comes boxed, together with a numbered certificate of authenticity. Ashby Bears proudly presents BENOTIME TEDDY BEAR “Your coffee is ready!”… Well okay – he may not be able to speak, but his fresh coffee aroma helps you to make the perfect start to your day! In fact, Benotime Teddy bear has a removable pouch on his back, which if you want, you can fill with coffee. His creamy-brown mohair coat combines all the colours of coffee. As a thoughtful friend he has even brought you a Steiff coffee cup made by Villeroy & Boch. Simply take your bear with you to work and you will always have your coffee close at hand. 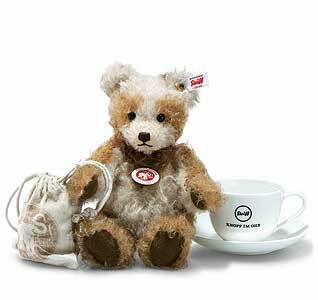 This adorable coffee companion is certain to enhance your day at work with charm, aroma and friendship!